Each day, it seems there's another intense partisan fight heating up Congress or sparking ire on our social media feeds. How have we become so polarized? As described in our new video above, media bias — and the technology that enables it — is a huge factor. News, social media feeds and search engines have become so narrowly filtered, biased and personalized that we are becoming less informed and less tolerant of different people and ideas. It's easier than ever to have your own opinion fed back to you — and never encounter a different point of view. 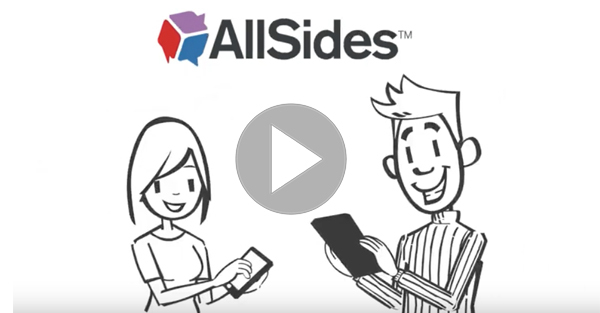 AllSides fixes this by freeing people from filter bubbles so they can better understand the world — and each other. Our balanced news service exposes people to information and ideas from all sides of the political spectrum, so you can decide the truth for yourself. On our site, you can rate your own bias, then check out our 600 Media Bias Ratings that make it easy to spot bias in the press. And don't forget to follow us on Facebook and Twitter for a more balanced newsfeed!